In the Pacific Ocean, under usual conditions tradewinds from the east pile up warmer surface waters to the west, bringing heavy rains to Indonesia, while off the coast of Peru cold waters rich in nutrients well up and attract fish. During an El Niño, however, the tradewinds slacken and sometimes even blow in the opposite direction. As a result, warm water flows eastward along the equator and pools off Peru, shutting off upwelling of cold waters. The shoals of anchovy disappear, leaving fishing fleets stuck in port, and the climate balance of the whole region is disrupted. 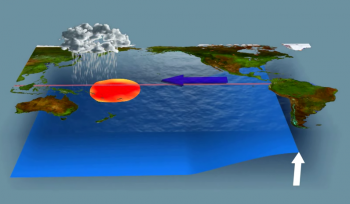 El Niño is a cyclic event. The Topex/Poseidon and Jason satellites have observed and studied the 1997 El Niño, the subsequent milder episodes of 2002 and 2007, and the 2015 event comparable in strength to 1997. In all, it’s thought that 60 million people were affected by extreme climate events in 2015-2016. It’s hard to know for sure whether the many effects observed on global climate were due to El Niño, a changing climate or both. The central and eastern Pacific Ocean has become hot and humid. Heavy rains have brought flooding to American coastlines, although with less impact than in 1997 because the event was less pronounced nearer to shore. Meanwhile, the weather in the western Pacific has become drier. In Indonesia and Papua New Guinea, drought conditions have stoked forest fires, albeit less severe than in 1997 when a record 2 million hectares of forest went up in smoke. We don’t yet have enough data to analyse all of the climatic consequences of an El Niño and attempt to predict them. Is climate change interacting with El Niño and if so to what extent? As the planet warms, will El Niño episodes get more frequent and intensify or more scarce? In this long quest to observe, understand and predict El Niño and its influence on climate, operational oceanography and altimetry satellites are going to prove vital.